In this technique the small intestine is divided 45 cm below the lower stomach. It is then arranged in a Y intersection in the proximal end of the small intestine, enabling food outflow through a Roux limb. In this technique the Y intersection is at the distal end of the small intestine. There is reduced absorption of fats and starches which are passed on to the large intestine. MGB is a relatively new procedure and less invasive. The stomach is divided and detached from the esophagus. The detached portion of the stomach is stapled and stitched. About 2 to 7 feet of intestine is also bypassed and the new, smaller portion of the stomach attached to it. Food is now received by this small stomach and continues its digestive process through the rest of the intestines. The gastric band operation reduces the capacity of the stomach with the help of a band. A small pouch is created in the upper stomach which can hold very little food. It is an adjustable gastric band, containing a circular balloon which is inflated. As you eat, the pouch fills up and the band restricts the passage of food to the lower part of the stomach. Gastric sleeve surgery can be accomplished as an open surgery or a laparoscopic surgery. A large part of the stomach is removed leaving only a tube shaped gastric sleeve for a stomach. The detached stomach is closed with surgical staples. Peptic ulcers are caused by Helicobacter Pylori. A large gastric ulcer in the lining of the stomach presents with severe upper abdominal pain and vomiting. Quite often these ulcers heal by medication. These ulcers can bleed massively requiring transfusion of blood and sometimes surgery. Surgery for ulcers will be in the form of partial gastrectomy called as Gastric Surgery. Cancer of the stomach is a very common ailment in southern India. Cancer of the stomach is in the form of a malignant tumor developing in the stomach. 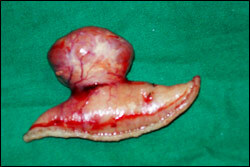 Stomach cancer is also called gastric cancer. These patients present with a varied presentation which includes weight loss, pain abdomen, vomiting or sometimes with no symptoms at all. 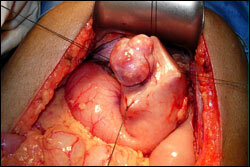 An upper GI endoscopy is usually diagnostic. Cancer of the stomach will primarily require surgery in the form of partial,total gastrectomy or bypass followed by chemotherapy if necessary. Severe heartburn due to hiatus hernia will at times require surgical treatment in the form of a fundoplication to reconstruct a new valve at the junction between the food pipe and stomach.